This has improved his speech and confidence dramatically! "Worth it’s weight in gold! The Word Wasp is a fantastic book. My son is 8 and has struggled with reading and writing since starting school. This book has helped us turn the corner…"
Confidence and self-esteem is amazing, she is a different young lady now. You’ve probably reached this page as you know of someone, be it a young child or an adult, who is having diﬃculties with reading, spelling or both. 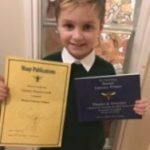 Whether they have had a formal diagnosis of dyslexia or not, the Word Wasp/Hornet will beneﬁt them! Or are you a parent/carer of a young child and anxious for them to have a head start? The Hornet is the ideal text to do this! Schools do not always have the capacity to be able to oﬀer a student one-to-one coaching on a regular basis. Children should not lose out! Teaching reading and spelling skills will enhance the life chances of your child or loved one. The Wasp and Hornet were designed for school and home or a mixture of both. You do not need to be a teacher or have experience of teaching. If you can read then you can teach using these texts! The programme can be delivered by anyone! The colour-coded instructions are so easy to follow. Designed for any student, adult or child, with literacy problems. Students learning English as a second language beneﬁt from its extensive phonic base. Students with speech problems beneﬁt from the same structure. Children and adults with poor auditory discrimination all demonstrate a marked improvement in clarity of speech after using the Wasp/Hornet! We understand that a student who is struggling has more than likely undergone lots of diﬀerent programmes in the past which have all failed them – this adds to their frustration and unwillingness to try anything else! The Wasp and Hornet are easy to use which makes them extremely successful: the incentive to learn more is produced as students complete the exercises. The structure of both books is built on the successful acquisition of one set of skills before they can progress to the next. The skills are introduced throughout the books to reinforce the rules - this is essential for memory training. In other words: students are never confronted by work that they are unable to attempt! They have been designed without using patronizing graphics or patronizing language, which means that the programme works just as well with teenagers and adults. Ideally, a period of 15-30 minutes a day would be great, however the programme has been delivered successfully on a weekly basis. Needless to say, the more often it is used the more eﬀective the programme becomes. A very inexpensive programme - our texts teach students and they also teach parents/carers, teaching assistants, volunteers etc. to be literacy coaches. The cost of a text is considerably less than one private lesson. "This has improved his speech and confidence dramatically"
"I would like to thank-you for the help and encouragement you have given my son at the age of 50 his spelling was very laborious and slow"
In the eight months since he got the W.A.S.P. book he has learnt more than in the eleven years he was at school. As his spelling improved, so did his reading and writing. He now has more confidence. Its a pity there wasn't such a book, as yours, when my son was at school forty-five years ago. "Worth its weight in gold. The Word Wasp is a fantastic book. My son is 8 and has struggled with reading and writing since starting school. This book has helped us turn the corner. " It is not an easy option and requires time, patience and hard work but it has got my son enthusiastically writing shopping lists for his mother and settling down on the sofa looking at books out of choice for the first time. It has also helped me to improve my spelling. A great book. "Confidence and self esteem is amazing. She is a different young lady now"
"The most worthwhile thing I've ever done...?" "It is very user friendly and doesn't require any special training. The 'Instructions for Coaches' are very straightforward." "great resource - would recommend it!" "Really good system. Having a huge impact on our 7-year-old"
"I think the Hornet is a fantastic book. I wanted a book that would teach my son (age 7) to spell and read better"
We are now on page 133 so we have almost finished the hornet. We are doing 15 minutes a day. It has made a big difference…. His confidence has surged as well and he loves it that he knows how to spell difficult words that his older brother (who is a great natural speller and finds spelling very easy) can't spell. We will be starting the Wasp when we’ve finished. I like the fact that the Wasp will be repeating the Hornet initially. Repetitiveness is good for my son and hopefully he will store things in his long term memory. 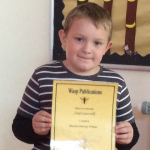 His reading fluency has definitely improved and he is reading polysyllabic words better. Knowing the spelling rules has really helped him. Once he knows the rule he remembers it and he becomes engaged. Any other method for him to learn how to spell just doesn't work and doesn't engage. In spite of extra daily practice and reading at home. "For a number of reasons our son was falling behind with his literacy skills,.. School agreed to help and suggested this literacy course. It takes a big commitment from you and your child to complete. We were already committing a great deal of time using other methods but not progressing greatly - we stopped all of that and concentrated on Hornet"
It was evident very quickly that it was a much better use of the time and our son has progressed enormously and we highly recommend it. He has become much more confident … and has moved up his school levels. We will start on Word Wasp to consolidate his learning from Hornet and we are confident he will continue to benefit from the clear, structured and manageable programme. "Great book. Recommended by educational psychologist. Worth buying"
"My daughter is in year 4 now and has a dyslexic profile. Her school have up until now not really been very bothered by it, but now she is in year 4 her spelling is obviously poor and all over the place. I ordered the hornet after a friend recommended it to me and we began using it 3-6 times a week. Her awareness of vowels has at last kicked in"
She is more confident and I can see how this programme is making a huge difference to her. I am thrilled with this book working for her and her school is now doing it with her 3 times a week, so she only needs to do it at home a couple of times a week. "Comprehensive system that actually works! I have just completed this with my now 9 year old, dyslexic daughter she was a non reader and after taking our time and completing maybe 15 mins 3 times per week she has gone from a non reader to a confident reader"
She now has the ability to read almost any word even previously unseen ones. The word hornet has given my daughter the gift of reading, all other methods had failed and having a dyslexic son we have tried many methods. It is so nice to find a system that actually works and also the encouragement from the beginning of the success and progress you child is achieving is enough of a benefit to ensure you complete the book. As we home educate I know that it is entirely down to word hornet that my daughter has been able to learn to read. 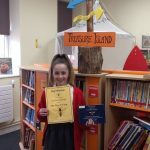 She now is able to read a book independently, which is a joy to see for a child that previously didn't have any interest in reading to herself. 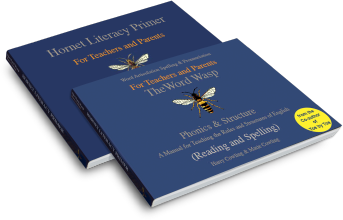 We are starting the Word Wasp as the benefits of these systems not only enable reading but also develop spelling and teach the rules of grammar. The word hornet is worth every penny, we did buy toe by toe but abandoned it in preference of this as it is so much quicker and the progress can be seen almost straight away. "An inspiring resource In October 2013 my 11 year old son's spelling was age 4-5 years. By February 2014 this was approximately 6-7 years. Previously, nothing seemed to work for him. He was very frustrated, as, although he has well above average general ability, early glue ear and severe hearing difficulties left him moderately to severely dyslexic with auditory processing and short term memory problems. An Educational Psychologist from Dyslexia Action recommended the Word Wasp"
but this was too tricky for my son to start with. Now, after all the wonderful auditory discrimination in the Hornet, he is ready to go back to the Word Wasp and keep on with his learning. These Manuals are excellent and I am full of admiration and gratitude for them, as a parent with a background in clinical communication studies. My son truly enjoys these books and is a really big fan. He especially appreciates the sense of humour and "nonsense" quality of using the low frequency words in reading passages. The Hornet is delightful and it works if you keep at it with a sense of humour and an awareness that training the brain can sometimes be as challenging as a sting in the tail! 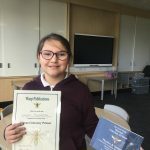 The hard work is a sting worthwhile and the Certificate for the Hornet, signed by the authors, was the most beautiful Certificate we had ever seen, including a secret message in the insect's wings! "Not just for dyslexics! My daughter is not dyslexic but her reading was a whole year below her actual age"
I was told that this primer is very good at filling in gaps in reading/phonic knowledge. It is a definite time investment. 10-15 mins every night for us. But wow, the benefits were fantastic. 8 months down the line and her reading age has jumped from 6.5 years to 10.5 years. But more ….her confidence has soared. …challenging books don’t frighten her off and she has the ability to read them. As they say: you can't argue with success. Which book? If unsure download our test for suitability. The Word Wasp is committed to protecting and respecting your privacy. We will only use your personal information to administer your account and to provide the products and services you have requested from us. For further information on how we collect, process and access your personal information including how you can change your marketing preferences and opt-out of any further communications, please see our privacy and cookie policies. If you have previously given your consent but now wish to opt-out of any further communications, please email us at: sales@wordwasp.com, or write to us at: The Word Wasp, [address]. You can also telephone on 0113 2109838.